. Published on July 30, 2015 . Why would paper products giant Kimberly-Clark turn to bamboo fibers in manufacturing its line of paper products? In a nutshell, sustainability. The company has committed to sourcing at least 50 percent of the materials used in its product lines from alternative, sustainable fibers by 2025. It’s an ambitious timeline, but Brenda Nelson, a director in the family care division, is confident they’ll succeed. “We did enough research on the fibers and potential barriers to know that it’s achievable,” she said in an interview. The company is using both bamboo and wheat straw to address two pressing concerns in the manufacturing process: The need for a more environmentally friendly and sustainable source of fiber, and the rapidly increasing costs in wood pulp. According to Forbes, the company saw a $240 million increase in expenses for wood pulp in 2014 alone. In addition, consumers are increasingly demanding products that are manufactured in a socially conscious, environmentally friendly way; alternative fibers such as bamboo address the needs of these consumers. Bamboo grows exponentially faster than trees used to make wood pulp, and it requires no fertilizers or pesticides in the process, making it a favorite source of sustainable materials. 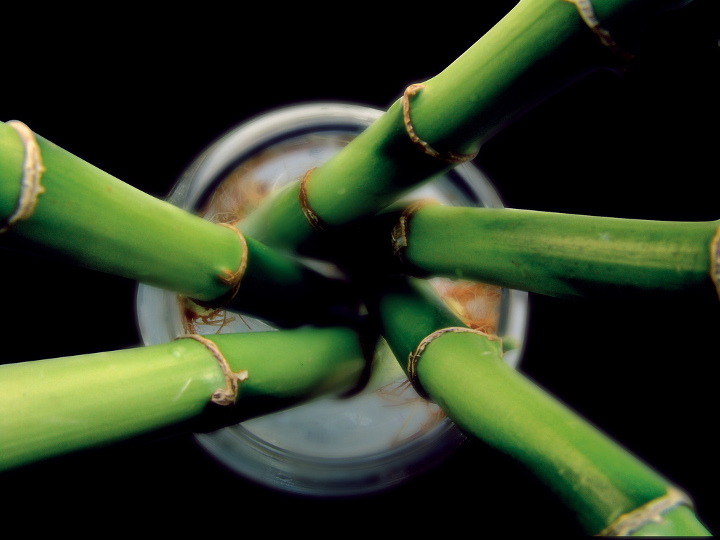 While the vast majority of the projected $17 billion commercial bamboo market is located in Asia, Kimberly-Clark has partnered with Booshoot, a biotech startup in Seattle, to grow non-genetically modified bamboo on a commercial scale in the U.S.
What Products Will Be Available? Staples currently carries a line of Kimberly-Clark copy paper made from 80 percent wheat straw, but the company is greatly expanding its offerings, launching a new line of GreenHarvest products under the Kimberly-Clark Professional division in 2015. The products include a Scott bathroom tissue made with 20 percent bamboo fibers, and a Kleenex brand paper towel line made using 20 percent wheat straw. These products will be sold to commercial customers such as hospitals, restaurants, and sports venues, and will not be available to individual consumers right away. However, the new line’s success will affect the timetable for launching consumer paper products. In 2012, Kimberly-Clark launched a line of bathroom tissue in the United Kingdom under the Andrex Eco brand, which is manufactured using 90 percent recycled fibers and 10 percent bamboo fiber. The Andrex Eco tissue was the first bathroom tissue product using bamboo fibers marketed at the retail consumer level in the U.K. The company also launched a line of Viva paper towels in Australia made with bamboo fiber in 2013. It was the first paper towel product to contain bamboo sold in that country. The bamboo used in this line is also certified by the Forest Stewardship Council, indicating that it is responsibly sourced from bamboo not used as food or habitat by pandas. The company has not released a specific timeline for rollout of particular products using the sustainable fibers, but it is has indicated its commitment to increase sales of sustainable and environmentally conscious products to 25 percent by the end of 2015. In addition, its commitment to increasing its use of sustainable fibers by 2025 indicates a fairly aggressive roll out of new products containing bamboo and wheat fibers in order to achieve its goals. Given the popularity of eco-friendly products, industry watchers expect to see new versions of prominent Kimberly-Clark products such as Huggies disposable diapers and Cottonelle bathroom tissue fairly soon. So far, major competitors such as Proctor & Gamble haven’t introduced any consumer paper products using bamboo fibers, and it’s unclear if they will in the near future. Kimberly-Clark is leading the way for consumers looking for sustainable fiber alternatives for their home paper products.